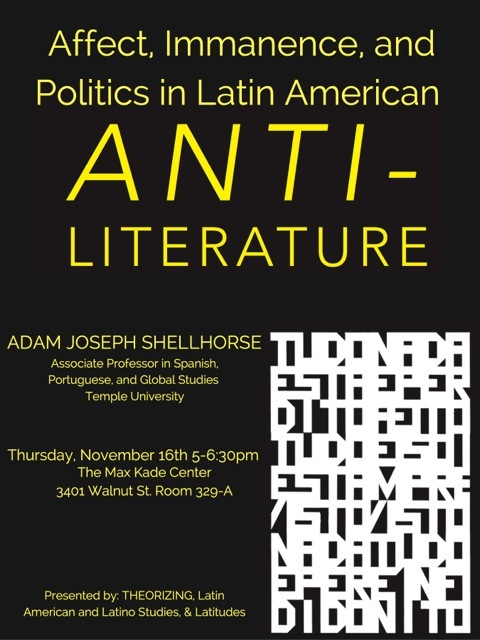 Prof. Shellhorse will be presenting on a topic related to his recent book, Anti-Literature, which articulates a rethinking of what is meant today by “literature.” Examining key Latin American forms of experimental writing from the 1920s to the present, Adam Joseph Shellhorse reveals literature’s power as a site for radical reflection and reaction to contemporary political and cultural conditions. His analysis engages the work of writers such as Clarice Lispector, Oswald de Andrade, the Brazilian concrete poets, Osman Lins, and David Viñas, to develop a theory of anti-literature that posits the feminine, multimedial, and subaltern as central to the undoing of what is meant by “literature.” Adam Joseph Shellhorse is Associate Professor of Spanish, Portuguese, and Global Studies at Temple University (Ph.D., University of California, Berkeley), where he serves as the advisor of the Portuguese and Brazilian Studies Program. He is the author of Anti-Literature: The Politics and Limits of Representation in Modern Brazil and Argentina (University of Pittsburgh Press, Illuminations, Cultural Formations of the Americas, 2017). His research examines modern and contemporary Latin American literature and poetics, visual culture, critical theory and women’s writing, with emphasis on comparative Inter-American studies and the relationship between aesthetics, affect, and politics. This event is generously sponsored by Theorizing, Latin American and Latino Studies, and Latitudes.